As of Thursday, Brown has worked out with Derek Carr for three consecutive days, Matt Schneidman of The San Jose Mercury News reports. The Raiders have an agreement in place to acquire Brown from the Steelers in exchange for a 2019 third-round pick and 2019 fifth-round pick, Ian Rapoport of NFL Network reports. Bills general manager Brandon Beane said he won't trade for Brown and has moved on to focus on free agency. While Ian Rapoport of NFL Network stated late Thursday that the Bills are close to acquiring Brown from the Steelers, the player is calling it "fake news" and another league source is calling the deal unlikely, The Buffalo News reports. The Steelers are drawing close to a deal that will send Brown to the Bills, Ian Rapoport of NFL Network reports. Analysis: The specifics of the trade have yet to be reported, but it appears as though sophomore quarterback Josh Allen and the Bills offense will have a new No. 1 receiving threat in 2019. The Steelers were ultimately unable to ship Brown out of the AFC, but they were able to avoid sending him to a divisional foe. The Steelers expect to trade Brown by Friday, league sources tell Adam Schefter of ESPN. Brown is drawing interest from at least six teams, with the Cardinals and Broncos recently joining the Raiders, Saints, Titans and Redskins in pursuit of the 30-year-old wideout, Dale Lolley of DKPittsburghSports.com reports. Niners GM John Lynch said he hasn't spoken with the Steelers about trading for Brown, Matt Maiocco of NBC Sports Bay Area reports. General manager Kevin Colbert said three teams have contacted the Steelers to discuss the possibility of trading for Brown, Ed Bouchette of the Pittsburgh Post-Gazette reports. Steelers general manger Kevin Colbert said Wednesday that he'll try to trade Brown this offseason but won't make a deal if the offers from interested parties are unsatisfactory, Ed Bouchette of the Pittsburgh Post-Gazette reports. Brown tweeted Tuesday about his meeting with Steelers owner Art Rooney II, saying they've cleared the air on several issues but both agree it's time for a parting of ways. Brown had a change of heart and now plans to meet with Steelers owner Art Rooney II, Ian Rapoport of NFL Network reports. Brown posted a tweet Tuesday thanking Steelers fans and saying it's "time to move on and forward." Brown said Thursday that he just wants to win and doesn't care where that happens, Jeremy Fowler of ESPN.com reports. The Steelers are exploring trade options, but neither team nor player has shut the door on the possibility of Brown staying in Pittsburgh for 2019, Ian Rapoport of NFL Network reports. Team owner Art Rooney II said Wednesday that the Steelers are "not closing any doors" on Brown's future with the franchise, Jeremy Fowler of ESPN.com reports. Though Steelers president Art Rooney II noted that the team does not plan to release Brown, he relayed Thursday that "all other options are on the table," Gerry Dulac of the Pittsburgh-Post Gazette reports. Analysis: With Pittsburgh's star receiver having "skipped out on practices and team meetings" in advance of the team's season finale, it's now quite conceivable that Brown could be traded this offseason. There's still time for the two sides to patch things up, but at this stage Rooney admits that it would be "hard to envision" the wideout being with the Steelers at the start of training camp in July. The Steelers are expected to consider trade inquiries about Brown (knee) from other teams this offseason, sources tell Ian Rapoport of NFL Network. Coach Mike Tomlin said Wednesday that Brown (knee) was held out of Sunday's 16-13 win over the Bengals due to a combination of injury and lack of communication with the team, Dale Lolley of DKPittsburghSports.com reports. Ian Rapoport of NFL Network reports Brown hasn't actually requested a trade. Brown has requested a trade, Jason La Canfora of CBS Sports reports. Brown's absence from Sunday's 16-13 win over the Bengals may have been the result of a dispute with members of the organization rather than the knee injury that had been the cited reason for his inactive status, Gerry Dulac and Ed Bouchette of the Pittsburgh Post-Gazette report. Brown (knee) was inactive for Pittsburgh's 16-13 win over Cincinnati in Week 17, finished the 2018 season with 104 catches (on 168 targets) for 1,297 yards and 15 touchdowns in 15 games. Brown (knee) is inactive for Sunday's game against the Bengals. Brown (knee) is taking part in a pregame warmup and remains hopeful to play Sunday against the Bengals, Ian Rapoport of NFL Network reports. Brown (knee) was unable to practice Saturday and is being viewed as a game-time decision Sunday against the Bengals, but the Steelers aren't optimistic about the wideout's chances of playing, Adam Schefter of ESPN reports. Brown (knee) is listed as questionable for Sunday's game against the Bengals after not practicing all week. Brown is slated to undergo tests to help determine the cause of his knee discomfort, Jeremy Fowler of ESPN.com reports. Analysis: Per the report, coach Mike Tomlin is leaving the door open for Brown to possibly play Sunday against the Bengals, but that's hardly a lock at this point. Added clarity on the wideout's status should arrive no later than the release of the Steelers' final Week 17 injury report, due to be released Friday afternoon. Brown missed Thursday's practice due to a knee issue, ESPN's Jeremy Fowler reports. Analysis: Brown also missed Wednesday's practice with what appeared to be a routine "coach's decision" designation. Friday's session will thus be very telling with regard to Brown's status for Sunday's game against the Bengals. Per Aditi Kinkhabwala of NFL Network, two of Brown's teammates relayed Thursday that they expect Pittsburgh's star wideout, who is dealing with a sore knee, to be a go this weekend. The Steelers need both a win and Baltimore loss in Week 17 to qualify for the playoffs. Brown corralled 14 of 19 targets, putting up 185 yards and two touchdowns during Sunday's 31-28 loss to New Orleans. Brown brought in four of seven targets for 49 yards and a touchdown in the Steelers' 17-10 win over the Patriots on Sunday. Brown brought in five of seven targets for 35 yards in the Steelers' 24-21 loss to the Raiders on Sunday. Analysis: Brown was clamped down on in a what was a surprisingly impressive effort by the Raiders secondary. The veteran speedster's yardage total was a season low, while his reception tally equaled his fewest in any game. Brown also saw single-digit targets for the first time in four games in what was a significantly underwhelming performance. He'll look to bounce back against the Patriots in a pivotal Week 15 showdown. Brown caught 10 of 13 targets for 154 yards and a touchdown during Sunday's 33-30 loss to the Chargers. Analysis: Brown caught two passes on the opening drive including a 46-yard reception that set up the first of two 1-yard touchdown runs by James Conner. Brown scored his team-leading 12th touchdown with 17 seconds remaining in the first half to give Pittsburgh a 23-7 lead and the 154 receiving yards was his best in a game this season. He'll next face Oakland, and in his last game against the Raiders, Brown set his single-game highs in receptions (17), targets (23) and receiving yards (284). Brown hauled in nine of 12 targets, racking up 67 receiving yards during Sunday's 24-17 loss to the Broncos. Brown caught five of 13 targets for 117 yards and a touchdown in Sunday's 20-16 win over the Jaguars. Brown brought in all six of his targets for 96 yards and a touchdown in the Steelers' 52-21 win over the Panthers on Thursday. Brown was cited by police Thursday in Ross Township, Pa. and charged with reckless driving, Channel 11 News Pittsburgh reports. Brown caught five of 11 targets for 42 yards and a touchdown in Sunday's 23-16 win over the Ravens. Analysis: Brown stretched his touchdown streak to six games with a six-yard score in the second quarter. He's operated below his lofty usual standards with only two triple-digit yardage performances thus far this season, but Brown's made up for that lack of yardage with nine touchdowns. Brown and the Steelers will have a quick turnaround with the Panthers coming to town Thursday in Week 10. Brown caught six of his eight targets for 74 yards and two touchdowns during Sunday's 33-18 win over Cleveland. Analysis: Brown caught a 43-yard touchdown from Ben Roethlisberger for Pittsburgh's first score, then added his second on a 1-yard screen pass just before halftime. His sideline grumbling earlier this season is a distant memory, as Brown has now scored a touchdown in five straight games and has eight of the team's 14 receiving scores through seven games. He'll now face the Ravens defense in Week 9, against which he caught five passes for 62 yards and a touchdown in a Week 4 loss. Brown caught five of six targets for 105 yards and a touchdown in Sunday's 28-21 win over the Bengals. Analysis: Brown was quiet for most of the game, but he won it by taking a slant 31 yards to the house with his team down 21-20 and 10 seconds remaining. The star wide receiver actually ranked fifth on the Steelers in targets, but his explosiveness allows Brown to excel even during dips in workload. 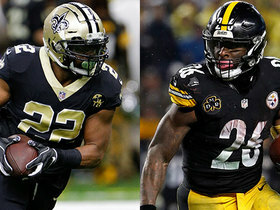 Pittsburgh will be on bye in Week 7, at which time star running back Le'Veon Bell is scheduled to return to the team. Brown brought in six of 13 targets for 101 yards and two touchdowns in the Steelers' 41-17 win over the Falcons on Sunday. Analysis: Brown was able to get into the end zone from nine and 47 yards out, with the latter score serving as Ben Roethlisberger's longest completion of the afternoon. It was also the perennial All-Pro's first 100-yard and multi-touchdown game of the season, and he's now crossed the goal line on four occasions overall in the last three contests. 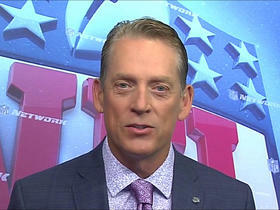 He'll look to torment an old foe in the Bengals when the Steelers travel to Cincinnati for a Week 6 divisional showdown. Brown caught five of 11 targets for 62 yards and a touchdown during Sunday's 26-14 loss to the Ravens. Brown caught six of nine targets for 50 yards and a touchdown in Monday's 30-27 win over the Buccaneers. Analysis: Despite all the noise leading up to this game, Brown had another relatively quiet outing, saved only by his second touchdown this season. Still, he has 42 targets through three games, so it may just be a matter of time before he busts out. That could come as soon as Week 4 against a Baltimore defense he torched for 213 yards on 11 catches in a 39-38 win last season. Brown will be present at the Steelers' facility Wednesday as the team begins preparation for its Week 3 matchup with the Buccaneers, Jeremy Fowler of ESPN.com reports. Steelers head coach Mike Tomlin said he plans to meet with Brown later Tuesday but wouldn't reveal whether the wideout was excused from Monday's team meeting and film-review session, Judy Battista of NFL.com reports. Brown wasn't present for the Steelers' team meeting and film review Monday, though it's unclear if his absence was excused or not, Ed Bouchette and Gerry Dulac of the Pittsburgh Post-Gazette report. Brown grabbed nine of 17 passes for 67 yards during Sunday's 42-37 loss to Kansas City. Analysis: Brown was targeted a whopping 17 times, but was kept mostly in check by Kansas City's defense. Frustrations boiled over as Brown could be seen arguing with his offensive coordinator. It shows how dominant Brown is that tempers can fly after back-to-back nine-catch games. Brown caught nine of 16 targets for 93 yards and a touchdown during Sunday's 21-all tie with the Browns. Coach Mike Tomlin expects Brown (groin/hip) to be full-go for Sunday's season opener against the Browns, Gerry Dulac of the Pittsburgh Post-Gazette reports. Analysis: Brown didn't play in the preseason as he managed his groin/hip issue, but he's back at practice and looks good to go for Week 1. That notion would be cemented if the wideout is either not listed on Wednesday's injury report at all or is listed as a full practice participant. Whereas Brown's Week 1 status is not in doubt, Pittsburgh's star running back, Le'Veon Bell, has yet to sign his franchise tag with the team. Brown, who sat out the Steelers' preseason finale, was at practice Monday, Dale Lolley of DKPittsburghSports.com reports. Analysis: That's more than can be said of star running back Le'Veon Bell, who has yet to sign his franchise tag with the Steelers. While Bell's situation hasn't been settled, Brown signed an extension with the Steelers last February that ensures he'll remain a centerpiece of the team's offense for the foreseeable future. Brown wasn't in uniform for Saturday's preseason contest against the Titans, Mark Kaboly of The Athletic Pittsburgh reports. Analysis: The Steelers indeed made the decision to hold out Brown at the last second, all but ensuring he won't play in a game before the regular season. With an unimpeded week of practice under his belt, though, he appears to have proven the health of the quad injury that has hindered him on occasion for the past month. Coach Mike Tomlin relayed Thursday that the Steelers will "decide at the 11th hour" if Brown (quad) will play Saturday against the Titans, Aditi Kinkhabwala of NFL Network reports. Analysis: Brown has been a limited practice participant this week, though Tomlin noted that the team simply is "managing" the star wideout's reps and "being smart." Brown thus represents a risky DFS play this week, but his Week 1 status is not in question at this time, nor is his standing as the top fantasy option at his position. Brown (quad) participated in Sunday's practice. Analysis: Brown has been bothered by his quad on-and-off since the beginning of training camp, but he's mostly been able to practice the past couple weeks. After sitting out Thursday's preseason loss to Green Bay, the 30-year-old wideout practiced in full pads Sunday and appeared to be moving without any issue. The Steelers may look to get Brown his first and only action of the preseason in Saturday's game against the Titans. 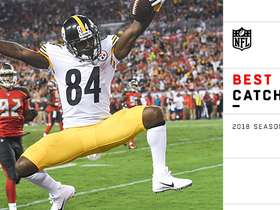 Brown (quad) won't play Thursday against the Packers, the Steelers' official site reports. Analysis: The same likely applies to several other key Pittsburgh veterans, but the decision to sit Brown on Thursday is an easy one, after he limped off the practice field Monday. Though the star wideout is said to be fine, there's no reason to push him to play in a meaninglessness game at this stage. Though Brown limped off the practice field Monday, he didn't aggravate his quad injury and is reportedly fine, Adam Schefter of ESPN reports. Analysis: Brown's short-term practice availability may be impacted, but news that his injury is nothing significant suggests that his top-tier status among fantasy's wideouts remains unchanged. Brown (quad) was walking and dancing around the sideline without a noticeable limp after he was removed from Monday's practice, Jeremy Fowler of ESPN.com reports. Analysis: Brown initially limped off the field but apparently wasn't too bothered by the injury thereafter. He returned to practice Saturday for the first time since the end of July, and while initial reports suggest Monday's aggravation wasn't too serious, it's still something that needs to be monitored throughout the week. The Steelers have no incentive to push Brown back into action for Thursday's preseason game in Green Bay. Brown limped off the practice field during Monday's session, Ed Bouchette of the Pittsburgh Post-Gazette reports. Analysis: There was a glimmer of hope regarding Brown's health when he returned to practice Saturday in full pads, but the wideout may have aggravated his quadriceps injury further during Monday's session. The Steelers haven't been particularly vocal about his recovery effort, so it remains to be seen if they'll clarify his situation in a timely manner. Brown (quad) is wearing full pads and participating in Saturday's practice, Dale Lolley of DKPittsburghSports.com reports. Analysis: Brown, who returned to the team Tuesday after tending to his minor quad injury back home, appears to be nearing full health as the Steelers wouldn't rush their star wide receiver back to practice on a bum leg. Although Brown's quad issue is essentially in the rearview mirror, he still might be held out of Thursday's preseason tilt against the Packers as a precaution. Other than Eli Rogers (knee), the remainder of the Steelers' receiving corps is in good health at this point. Brown (quad) rejoined the Steelers on Tuesday and is expected to resume practicing this weekend, Jeremy Fowler of ESPN.com reports. Analysis: Brown spent five days away from the team to receive evaluation and treatment for an undisclosed injury that apparently isn't too serious. The Steelers have no incentive to rush him back to practice, as Brown presumably would be held out of Thursday's preseason opener against the Eagles even if he were 100 percent healthy. Brown, who was sent back to Pittsburgh to have an unspecified injury evaluated, is expected to be fine in a few days, ESPN's Jeremy Fowler reports. Analysis: Coach Mike Tomlin declined to specify the nature of Brown's issue, but at this stage it doesn't seem to be a major concern. Per Tomlin, it's "just a day-to-day, minor injury. Nothing to speak of." With that in mind, we'll continue to view the Steelers' star wideout as day-to-day. Brown is considered day-to-day with an undisclosed injury, Jeremy Fowler of ESPN.com reports. Analysis: Per the report, the Steelers have sent Brown back to Pittsburgh for evaluation, but other than implying that the injury is minor, coach Mike Tomlin would not specify exactly what is ailing his star wideout. Brown didn't practice Wednesday due to an undisclosed injury, Dale Lolley of DKPittsburghSports.com reports. Analysis: Per Jeremy Fowler of ESPN.com, Brown was spotted on the field Wednesday, so it looks like his issue is minor and his lack of practice participation may have been maintenance-related. Brown restructured his contract Wednesday to facilitate more cap space for the Steelers in 2018, Ian Rapoport of NFL Network reports. Brown totaled 132 yards and two touchdowns on seven receptions in Sunday's 45-42 AFC divisional-round loss to Jacksonville. Analysis: Targeted 11 times, Brown showed no signs of the calf injury he suffered in Week 15, scoring Pittsburgh's first touchdown of the game. He added his second score on an incredible fourth-down catch as he fell backwards in the end zone. Given his outstanding performance this season, there's no reason to think that Brown won't continue to be among the league's elite wide receivers in 2018. Brown (calf/illness) is listed as active for Sunday's divisional-round playoff game against the Jaguars, Adam Schefter of ESPN reports. Brown (calf/illness), who is listed as questionable for Sunday's divisional-round matchup with the Jaguars, is expected to "give it a go" and play, though his partially torn left calf muscle is "not close to 100 percent," a source informed Adam Schefter of ESPN. Brown (calf/illness) is listed as questionable for Sunday's playoff game against the Jaguars after missing Friday's practice because he was under the weather. Brown missed Friday's practice due to an illness, Aditi Kinkhabwala of NFL Network reports. Analysis: On the plus side, the wideout, who is bouncing back from a calf injury, had looked good at practice earlier in the week. While sitting out Friday's session with a case of the flu is not optimal, we still expect Brown to be a go in Sunday's playoff game against the Jaguars. We'll circle back on his status later Friday to see how the Steelers list him on their final injury report of the week. Brown (calf) practiced fully Wednesday. Analysis: Brown, who hurt his calf back on Dec. 15, is thus on track to return to action for Sunday's playoff game against the Jaguars. Assuming no setbacks in the next couple of days, look for the Steelers' top wideout to approach this weekend's contest minus an injury designation. Steelers head coach Mike Tomlin classified Brown (calf) as a "full" participant in Monday's practice, Ed Bouchette of the Pittsburgh Post-Gazette reports. Brown (calf) returned to practice Monday, Ed Bouchette of the Pittsburgh Post-Gazette reports. Brown (calf) is on track to be at full strength for next weekend's divisional-round playoff contest, Ian Rapoport of NFL Network reports. Analysis: Brown, who has not played since Week 15, benefited from the Steelers' first-round playoff bye and is now on track to return to the team's lineup for next Sunday's home playoff contest against an opponent to be determined. Added context regarding the star wideout's status will arrive next week, when the Steelers submit their divisional-round practice/injury reports. Head coach Mike Tomlin said Tuesday that Brown (lower leg) is progressing well in his rehabilitation, Ed Bouchette of the Pittsburgh Post-Gazette reports. Brown (lower leg) missed his second straight game, finishing the 2017 season with 101 catches (on 162 targets) for 1,533 yards and nine touchdowns in 14 games. He added 61 yards on 11 punt returns. Steelers head coach Mike Tomlin said Tuesday that he didn't have an update on Brown's (lower leg) condition, but indicated the wideout has been ruled out for Sunday's game against the Browns, Chris Adamski of TribLive.com reports. NFL Network's Ian Rapoport indicated Sunday that the Steelers expect Brown, who is out this week with what is described as a calf strain, to be back in form "by the time they take the field in the playoffs whether or not that is the first round or whether or not they get a bye." Brown (lower leg) likely wouldn't be available for the wild-card round of the playoffs if the Steelers fail to finish as one of the AFC's top two seeds, Adam Schefter of ESPN reports. Steelers head coach Mike Tomlin confirmed Tuesday that Brown is dealing with a significant lower-leg contusion and would be held out of Monday's game against the Texans, Aditi Kinkhabwala of NFL Network reports. Brown (calf) will miss the rest of the regular season, Ian Rapoport of NFL Network reports. Brown has a partially torn calf muscle and isn't expected to play in Week 16 against the Texans, Adam Schefter of ESPN reports. Brown (calf) is headed to the hospital for further evaluation and won't return to Sunday's game against the Patriots, Ian Rapoport of NFL Network reports. Analysis: Brown was removed early in the second quarter and initially deemed questionable to return. A previous report said X-rays came back negative and the injury was believed to be a bruise, but the need for a trip to the hospital suggests the Steelers still haven't eliminated the possibility of a severe injury. The team officially ruled Brown out for the rest of the contest at the beginning of the third quarter. Martavis Bryant and Eli Rogers are handling expanded roles alongside JuJu Smith-Schuster. Brown is headed to the hospital to have his left calf injury further evaluated. Analysis: As a result, Brown will not return to Sunday's game and the fact that he has been taken to the hospital suggests that the wideout's status for next Monday's game against the Texans could be in danger. In Brown's absence, the Steelers' Week 15 wideout corps will be headed by Martavis Bryant, JuJu Smith-Schuster and Eli Rogers. Brown has been diagnosed with a bruised calf, indicating that X-rays came back negative, Ian Rapoport of NFL Network reports. Analysis: Brown was removed from Sunday's game against the Patriots early in the second quarter after he collided with a defender on an incomplete throw to the end zone. He was unable to return before halftime, but the Steelers aren't yet ready to rule him out for the entire contest, deeming the superstar wide receiver questionable to return. Martavis Bryant and Eli Rogers have taken on expanded roles in Brown's absence. Brown suffered a left calf injury in Sunday's game against the Patriots. Analysis: Prior to his exit, Brown caught two of his three targets for 24 yards. Next up for the team's wideout looks in his absence are JuJu Smith-Schuster and Martavis Bryant. The Steelers deemed Brown questionable to return to Sunday's game. Brown was forced out of Sunday's game against the Patriots with an apparent leg injury. Analysis: Initially the star wideout had trouble putting weight on the affected leg, and after being checked out on the sideline, he headed to the locker room for further evaluation. Once the Steelers officially report his injury, we'll circle back on Brown's status. Brown secured 11 of 18 targets for 213 yards during Sunday's 39-38 victory over the Ravens. Brown (toe) was a full practice participant Friday and doesn't have an injury designation for Sunday's game against the Ravens, Joe Rutter of TribLive.com reports. Analysis: Brown played through the same injury last week and caught eight of 15 targets for 101 yards and a touchdown in a 23-20 win over the Bengals. Unlike last week, his availability won't be in any question as the Steelers prepare for a primetime matchup with an AFC North foe. The Baltimore pass defense has been among the best in the league, but the loss of top cornerback Jimmy Smith (Achilles) should work in Brown's favor. Brown (toe) did not practice Thursday. Analysis: Brown ended up as a game-time decision for this past Monday night's win over the Bengals after missing practice both Friday and Saturday, but he ended up playing every snap on offense in the game, en route to hauling in eight catches for 101 yards and a TD. We suspect that the star wideout isn't in danger of missing Sunday's contest against the Ravens, a notion that would be solidified by Brown's return to practice, in any capacity, Friday. Brown caught eight of 15 targets for 101 yards and a touchdown in Monday night's 23-20 win over the Bengals. Brown (toe) is listed as active for Monday night's game against the Bengals, Teresa Varley of the Steelers' official site reports. Brown, who is listed as questionable for Monday's game against the Bengals, plans to test out his injured toe in warmups before the Steelers render a decision on his status, Adam Schefter of ESPN reports. Brown (toe) is called a game-time decision for Monday night's game against the Bengals by Gerry Dulac of the Pittsburgh Post-Gazette. The Steelers are hopeful that Brown (toe), who is listed as questionable for Monday's game against the Bengals, will play in the contest, but the team has been preparing its other receivers in the event the wideout is sidelined, Jeremy Fowler of ESPN.com reports. The Steelers have listed Brown (toe) as questionable for Monday's game against the Bengals, Ray Fittipaldo of the Pittsburgh Post-Gazette reports. Brown missed Friday's practice with a toe injury. Analysis: In-week additions to the injury report can be concerning, but in this case, Ian Rapoport of NFL Network relays that Brown's toe issue is minor and that the wideout "should be fine going forward." Brown's status will be revisited Saturday, but if the receive returns to practice, he could be removed from the Steelers' Week 13 injury report in advance of Monday's game against the Bengals. 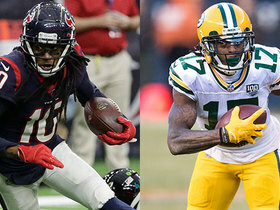 Brown caught 10 passes on 12 targets for 169 yards and two touchdowns during Sunday's 31-28 victory over the Packers. Brown brought in 10 of 13 targets for 144 yards and three touchdowns in Thursday's 40-17 win over the Titans. He also fumbled once but it was recovered. Brown brought in three of seven targets for 47 yards in Sunday's 20-17 win over the Colts. 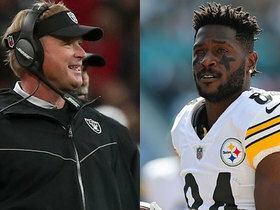 Former NFL head coach Jack Del Rio joins "Up to the Minute" to talk about Oakland Raiders wide receiver Antonio Brown's and Pittsburgh Steelers WR JuJu Smith-Schuster's Twitter feud. Watch as Pittsburgh Steelers WR Antonio Brown arrives at training camp via a helicopter. 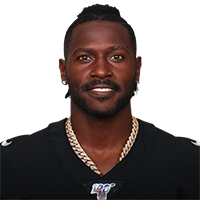 Oakland Raiders wide receiver Antonio Brown chats about his relationship with quarterback Derek Carr, why he wanted to play with the Raiders and what he wants to say to the fans. 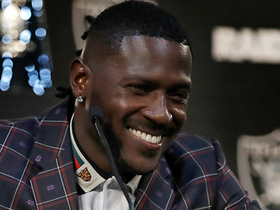 Former Dallas Cowboys wide receiver and NFL Network's Michael Irvin discusses the trade of wide receiver Antonio Brown to the Oakland Raiders. 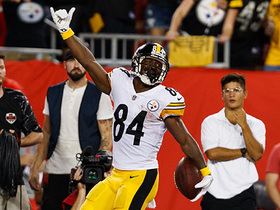 Check out Pittsburgh Steelers wide receiver Antonio Brown's best catches of the 2018 season. 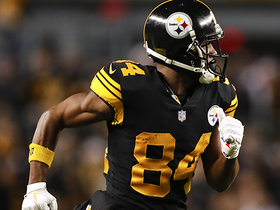 NFL Network's Ian Rapoport discusses what Pittsburgh Steelers general manager Kevin Colbert had to say about trading Antonio Brown. NFL Network's Tom Pelissero discusses Pittsburgh Steelers wide receiver Antonio Brown's trade value.